Back in the 1970s, the English TV playwright Dennis Potter wrote a column in The Guardian. In it he said that the one thing the general public cannot bear is to hear the truth, and those who try telling it will, metaphorically if not literally, have the flesh torn from their bones. 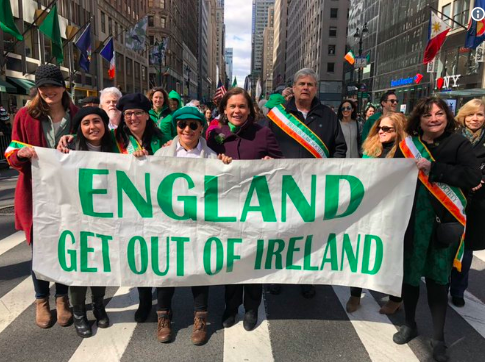 The latest example of Potter’s Law was last week when Mary Lou McDonald was pictured in New York, close to a banner declaring ‘England Get Out Of Ireland’. For doing this she was savaged by many. The mask had slipped. This wasn’t just a tough little Dub with no links to a violent past. This was an intolerant, antediluvian republican who wanted to push all unionists out of Ireland. The fact that Mary Lou had said nothing of the sort didn’t matter. She had stood behind That Banner. Well actually, no. It’s called the Good Friday Agreement, where the Irish people agreed to suspend the normal rules of democracy, by which a country organizes its affairs in accordance with the wishes of the majority. The GFA gave consent to a suspension of the usual rules and allowed for a majority of those in the north-east corner of Ireland to decide when English rule in Ireland should end. If ever. But whether the principle of consent breaches or doesn’t breach the normal right to national self-determination, the core fact remains: it is the assertion of English rule in Ireland which was the reason behind centuries of violence here and which, if we’re not careful, may lead to further violence. All That Banner did was pin-point where the source of our Troubles lies, and all that Mary Lou did was stand near That Banner. For which, as I say, she was seen as deserving of verbal flaying. Never underestimate the public’s rage with those who speak the uncomfortable truth. Or even dare to stand near it.